To learn more about your own personality, and to read other cool topics on the human psyche, point your browser to Blog@TeechConsult where you will find related information in Bahasa Malaysia - Ed. And just who is Anita Roddick, really? 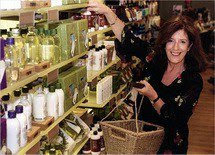 Dame Anita Roddick was the founder of The Body Shop, a world famous body care and makeup chain with more than 2,000 shops in the world. The Body Shop is the second most trusted and most famous brand label in the whole world, and it turned Dame Roddick into a billionaire. Against Animal Testing – The Body Shop believes that testing cosmetics on animals is unethical, unnecessary and should be banned. Support Community Trade – The Body Shop buys the highest quality natural ingredients and hand made products, from the best people, for a fair price. Activate Self Esteem – The Body Shop does not sell promises, or an unattainable ideal of beauty. We believe that there's no one way for a woman to look. Defend Human Rights – The Body Shop believes that we have a responsibility to ensure, respect and honor the human rights of those who trade with us. Protect our Planet – The Body Shop aggressively promotes the use of renewable resources and sustainable ingedients to safeguard the future of our planet. Dame Anita Roddick, died on September 10, 2007. Leaving ALL her money for charitable causes, and none for her family. Her two daughters unbelievably, totally agreed with their Mommy’s decision. Anita Roddick was, and still remains, an utterly brilliant personality – Ed. I love Anita Roddick's gueriila marketing approach ... so simple; just the way late Estee Lauder did when Galeries Lafayette refused to approve her application for a concession in Paris - drop some perfume on the floor and let the scent's magic work.